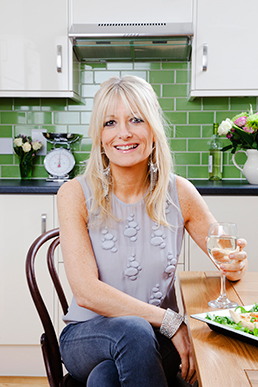 "My passion for healthy eating"
Q: Do you like to take a natural, holistic approach to health and wellbeing? Gaby: "Yes, very much so. I’ve got a real interest in health, nutrition and exercise. Both my parents were diagnosed with cancer 18 years ago and my mum died but my dad survived. So I decided to look into the benefits of nutrition and complementary therapies. I haven’t got letters after my name, but I’ve done a great deal of research and it’s something that I’m passionate about. Now, I’m finding that all the things I’ve been banging on about for years are coming to fruition, like cutting down on refined sugar and processed meat. My friends keep saying: “Oh Gaby you were right!” "
Q: Do you and your family always try to eat healthily? Gaby: "Yes. On the whole everything we eat is organic. The only meat I eat is free range organic chicken and sustainably caught fish. I usually start the day with porridge made with water and topped with flaxseed. For lunch I might have a homemade vegetable soup or a quinoa salad with some avocado and beetroot. In the evening we’ll all have something like chicken or fish cooked with oil and herbs plus plenty of steamed vegetables. The only snacks I'll have during the day are a handful of nuts and seeds. The children are very aware of what’s healthy and what’s not, but I’m not one of those mothers who gives them a picnic tub to take to children’s parties. They’re allowed the odd bit of chocolate." Q: Do you allow yourself a few treats? Gaby: "I don’t actually like sweet things so for me it’s no big deal. I don’t like chocolate or sweets or anything like that. My failing is that if I’ve drunk too much I do like a bowl of chips." Gaby: "What’s the point of doing that? That will make you ill. I think positive thinking is vital to a healthy life. I think that’s what helped my father get through cancer. He had a very positive outlook on life." Q: What complementary therapies do you find most beneficial? Gaby: "The girls and I go to see a homeopath and my husband has Traditional Chinese Medicine for his health. I’ve tried a lot of complementary therapies but I particularly like reflexology and reiki. Both my children had cranio sacral therapy after they were born. We also embrace regular medicine if we need it." Gaby: "Yes I do but I don’t like to say which ones I take because they’re not necessarily right for everybody. Everyone is so individual so what will work for one person won’t necessarily work for another. I’ve seen a number of people from nutritionists to naturopaths and I’ve worked out what my body needs. I try to get the majority of nutrients from my food, but I think taking certain supplements can really help too." Gaby: "I do pilates. I have a bad back and it fixed that. I also go to the gym four times a week. I do some cardio on the bike and then I do a mixture of weights and TRX training." Gaby: "For me, going to the gym is my switch-off time. It gets my head in the right place. Afterwards I’ll jump in the sauna for 10 minutes to ease my aching muscles. I also love television, theatre and cinema. I’d love to be able to say that I meditate but I just don’t have the time. I used to be much better about doing visualisation and meditation. I know it’s wonderfully good for you but, as a working mum and doing the kind of job I do, it just isn’t possible to fit it into my day." Q: Do you like to use natural beauty products? Gaby: "Yes. I swear by the Neal’s Yard Remedies frankincense range. It’s completely changed my skin. It’s fantastic for fine lines, which is important as you get older." Q: What projects have you got coming up in the future? Gaby: "I’ll be presenting a new series of Food Inspectors on BBC 1 this month. It’s going to be really interesting for me to take a closer look at what’s actually in our food, as it’s a subject I’m so passionate about. Some of the results are quite eye-opening!"